December is the fastest month. I mean seriously, I feel like we take the days two at a time. 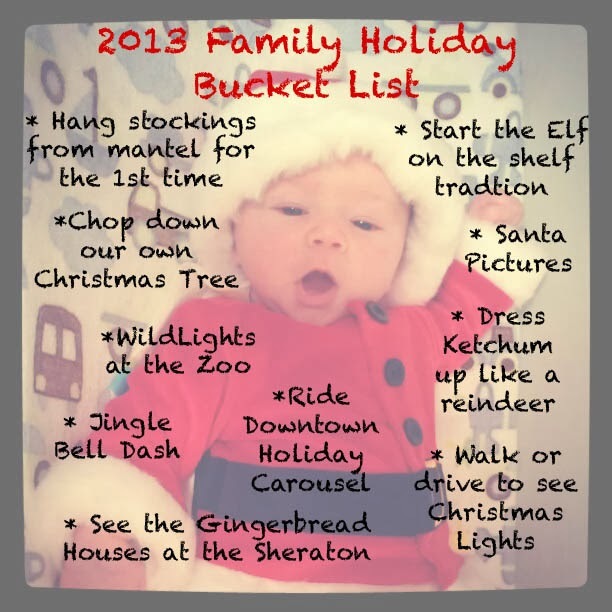 With so much going on at work and in our busy lives, we have made sure to carve out family time to accomplish our Holiday bucket list. We are close to checking everything off, and we still have a few days left to get them all done (a few we hope to accomplish today). Decorating the mantle was fun, but decorating the wall behind it definitely was more difficult. Since it's lath and plaster, with a textured finish, absolutely nothing sticks to it- and I'm reluctant to put a ton of holes in it.....so the snowflakes you see below, were supposed to be mounted on the wall. We went over to Redmond and chopped down our own tree for the second year in a row. Hunter and I were the pickers and Chris was the chopper/sawer. Hunter was very excited to run around the tree farm, tripping over stumps and throwing branches- he loved it. This was our first time at WildLights and it was a great night. We waited to go until my older sister, her husband and her daughter got into town, and then we gathered our parents and my little sister and headed out to check out the lights. The kids couldn't get enough of the pretty lights. So, we already know that Santa did not go well..... we are hoping for better next year. My mom, little sister and I braved the cold to do our annual Jingle Bell run in downtown Seattle. We walked it this year, which made it much easier to drink our hot chocolates and eat our scones....our priorities are in place. Hunter enjoyed the people watching, but didn't enjoy his hat....he took that thing off as soon as we snapped this picture. We did this one, but somehow I haven't managed to get any pics of our Elf, who I've been lovingly calling Elfie. Hunter likes to carry Elfie around, and usually he can be found sitting in the poinsettia on our mantel. Next year, I'll be getting more creative. This one is only kind-of accomplished. I didn't dress him up so much as I turned him into a reindeer all together! We had a snow day last week here in Seattle so we bundled up and headed out to play in it and try out Hunter's new sled. Ketchum was VERY excited about the snow and couldn't stop jumping and running all over the place. So, instead of trying to reign him in, I strapped the sled to him and let him pull his brother around the block. They both LOVED it. So, we've been busy, but the best kind of busy. I love this time of year. 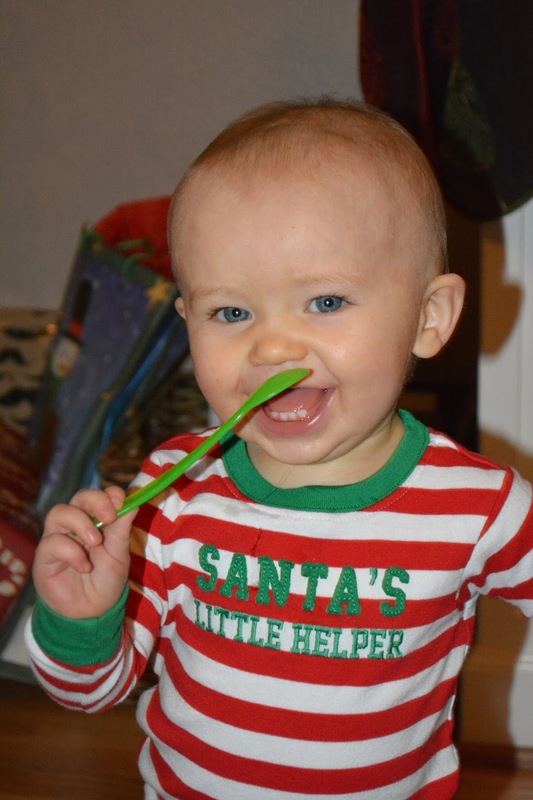 Last, but not least, here's my little Christmas Elf flashing his new chompers.